In our last meeting of the spring season, a vote was taken to read The Pursuit of Italy for the fall meeting. 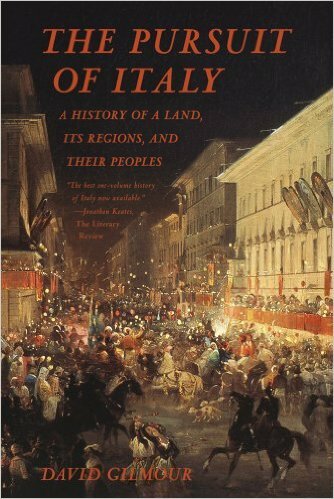 In this book, Italy is shown as a country that has never succeeded in unifying into a single state, but has remained essentially an amalgamation of distinct city-states with little in common. As reported in Publisher’s Weekly Review, “In captivating prose, Gilmour chronicles the history of Italy by exploring the many Italys that compose the peninsula. For example, Virgil believed that the country was a place of extraordinary diversity, but that its strength lay in unity in diversity; for him, Roman Italy was not a glorified city-state but an entity that resembled a nation, a territory of shared values and experiences. Augustus, on the other hand, believed Italy was not a cohesive unit but an administrative convenience. . . .
At the behest of one of our longtime members, however, who has not commented favorably on The Pursuit of Italy, and given the somewhat more leisurely pace associated with the summer months, we have added a second book, (or partial book, at the least ) to our recommended reading for the September meeting. The book is Rome: A Cultural, Visual and Personal History. It presents a singular, no-holds-barred perspective on the city’s history, art, architecture, leading figures, politics and other aspects of its culture. Its author, Robert Hughes, was the highly influential, longtime senior art critic for Time magazine. We particularly recommend the chapters on ancient Rome. This book was the runner-up when we selected our book for the September meeting. It is a highly spirited read and will engage anyone who may not be absorbed sufficiently by The Pursuit of Italy. The two books give a rich and diverse picture of ancient Italy, a country which, in any era, is on everyone’s favorites list; if you choose to read only one – the choice is yours! We will discuss both on September 15 in Scarsdale. Good reading – stay cool!